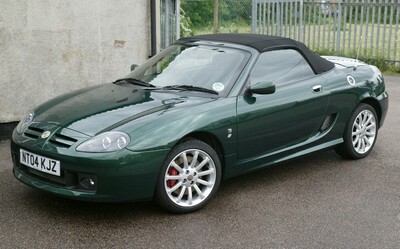 I bought Bob in October 2004, from Geo Harrison, a small dealership in my hometown of Whitby, North Yorkshire. It was a total impulse purchase. My wife and I were in town to visit my folks in Sandsend just up the coast. We were thinking of replacing the Renault we had at the time, as it was 3 years old. I drove past Harrisons, and saw Bob parked on the forecourt. It was love at first sight (ooo errr...) so we called in, I took him for a test drive, and a week later traded in the Renault and collected him! We've never looked back! 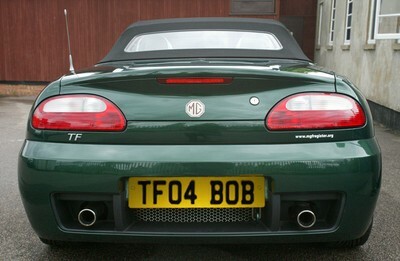 Bob is clad in British Racing Green 3, a pearlescent finish, and in my opinion one of the nicest colours in the range. 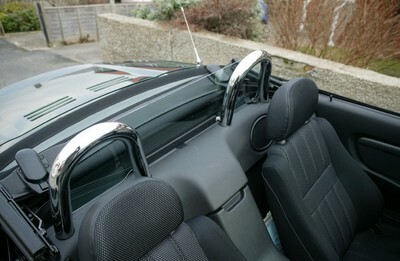 The interior is ash with sebring and leather seats. Far from a standard 135, Bob has both Sports Packs 1 and 2, which consists of lowered (- 10mm), stiffened suspension with 16" eleven spoke alloy wheels and uprated front brakes. To compliment the beautiful colour, he has the chrome 'bright pack'. 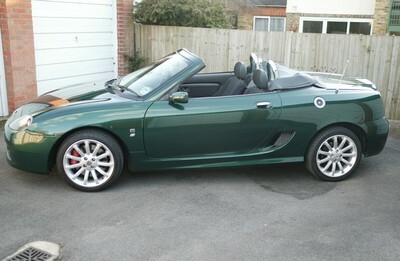 Finally he has a colour coded hard top - but this lives in the garage for most of the year! I've added several other things to Bob over the last 18 months, including, Mike Satur Boxer Mk3 hoops and glass windstop, a BAS-International mohair hood with heated glass rear screen, an electric boot release and a complete dashboard lighting change. The standard lighting in the TF is a bit dated in my opinion, so out went the orange illumination and in came the blue lighting. I changed the lighting in the instrument pack, oil and temp gauges, the heater controls, the radio and all the switches. Blue lighting may be considered by some to be a bit "barry" but I happen to like it! Check out the darkside page for more info on how the changes were brought about. Bob also has MS heater knobage, a custom aerial and various other bits. But why on earth give your car a name? Bob? ...honestly! Its tradition in MG circles (more so in the F and TF community) to name your car. I was totally stuck for a name. Many people take their registration plate as a prompt for a name. Mine however had k and z in it, and didn't bode well for a name. I also couldn't decide on a gender for the car either. I thought it should be female since I had fallen in love with it so quickly, but the lines of the TF are more masculine and aggressive than those of the earlier MGF. An episode of Black Adder came to mind. It was the one where a servant girl disguises herself as a boy, and calls herself Bob. Edmund falls in love with her, much to his surprise and confusion! Only at the end does she reveal herself! It seemed fitting somehow, and a bit unusual. Coming soon... why I had to waxoyl my under floor coolant pipes as a matter of urgency!